Project Walk meets Project Jump! It’s December 1st, the day Nick was going to jump, until we decided to push it back a week. The forecast was for rain today, and at the moment it’s overcast but will likely clear. We’re still happy with our decision to wait another week because it gives us more time to plan for the fundraising efforts we’d like to make during the event. Yes, the gathering will be because of Nick and his achievements, but we want the spirit of the day to be about helping other people. 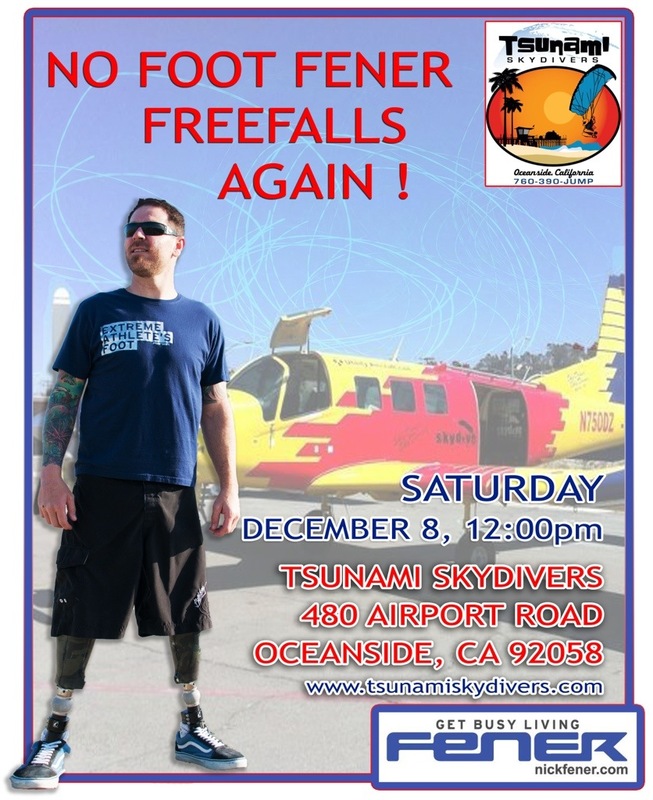 If you plan to come watch Nick jump, please raid your pantry and bring some non-perishable food items to donate. The more the better! I just know you’ve got a can of beans or a box of rice you can stand to part with to help feed people who really need it this holiday season! Please bring a bare minimum of ONE item that day. The person who brings the most food items will get a prize, which may or may not be a giant hug! We are also selling FENER shirts and stickers to raise money for the Project Walk Scholarship Fund! There are tons of people suffering from spinal cord injury who don’t have the support or funds to get specialized therapy at Project Walk. We are raising money to donate to the scholarship fund to help others who want to go to Project Walk but can’t afford it. Because of our fundraising efforts, we have decided not to accept the kind offer of a group discount for tandem jumps, and instead take that $20 difference and donate it to Project Walk. Tandem jumps are $209 and can be scheduled by calling 760-390-JUMP.